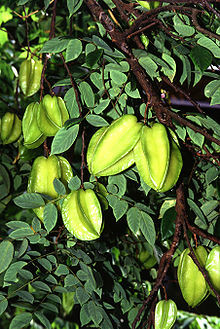 Averrhoa carambola is a species o widdy plant in the faimily Oxalidaceae; it has a nummer o common names includin Carambola an Starnfruit. This evergreen tree is native tae Sootheast Asie an the Indian Subcontinent. A. carambola is a smaa tree or shrub that grows 5–12 meters taw, wi rose tae reid-purpie flouers. The flouers are smaa an bell-shaped, wi five petals that hae whitish edges. The flowers are eften produced year roond unner tropical condeetions. The tree is cultivated in tropical an semitropical regions for its edible fruits and for medicinal uises. This page wis last eeditit on 2 September 2013, at 14:43.